Cyprus is located at the crossroads of the three major flora zones of Europe, Asia and Africa, and it is therefore not surprising that the number of plant species found on the island runs to 1,750, of which 126 are endemic. In the Akamas Peninsula the number of species is approximately 530, of which 33 are endemic. Thus, the ecological and scientific value of the area is self-evident. Aleppo Pine forests, Phoenician juniper maquis, Rock Rose maquis, and mosaics of Aleppo Pine stands with maquis are the major plant communities of the area. The maquis are characteristic of the Mediterranean climate. The variety of fauna is equally as impressive: 168 birds, 12 mammals, 20 reptiles and 16 butterfly species have been sighted in the area. With its approximately 1,800 species and subspecies of flowering plants, Cyprus is an extremely interesting place for nature lovers and has all the attributes which make it a botanist's paradise. Being an island, it is sufficiently isolated to allow the evolution of a strong endemic flowering element. At the same time being surrounded by big continents, it incorporates botanological elements of the neighbouring land masses. About 8% of the indigenous plants of the island, 125 different species and subspecies, are endemic. The island's great variety of habitats, attributed to a varied microclimate and geology, is the main reason which contributed to this high number of endemics. The arrival of animals in Cyprus has been a subject of interest to zoologists, since it has always been an island. According to existing evidence, the first arrivals were hippopotami and elephants, both excellent swimmers. They arrived 1,5 mil. years ago and apart from some shrews and mice, were the only land mammals roaming the island prior to man's arrival 9,000 years ago. The present-day fauna of Cyprus includes some 7 species of land mammals, 26 species of amphibians and reptiles, 357 species of birds, a great variety of insects and mites, while the coastal waters of the island give shelter to 197 fish species and various species of crabs, and sponges. The largest wild animal that still lives on the island is the Cyprus moufflon (Ovis orientalis ophion), a rare type of wild sheep that can only be found in Cyprus. Cyprus is used by millions of birds as a stepping stone during their migration from Europe to Africa and back, something that has been observed since Homeric times. The main reason for that is the occurrence on the island of two wetlands, with unique and international importance, namely Larnaca and Akrotiri salt lakes. The fauna of Troodos reflects the rich flora of these mountains and the wide spectrum of habitats it has. Here one can spot mountain butterflies and damselflies as well as many bird species not found elsewhere on the island. There are endemic lizards and snakes. Freshwater crabs and frogs can be found in several of the mountain streams - both are recovering from the use of DDT that was widely used in the antimalaria campaign. Trout was introduced in several streams in 1948 for the first time and is reproducing there. 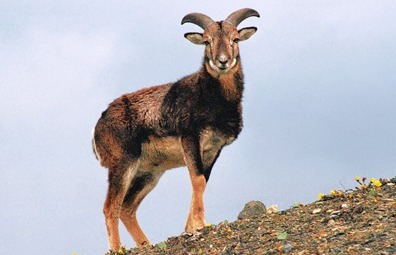 The most spectacular animal of these mountains is no doubt the Cyprus Moufflon. The first inhabitants of the island, in the neolithic period, apparently brought with them various animals, deer, wild boar, moufflon and a kind of wild goat. Some of them must have escaped and formed wild populations. Some took refuge in the largely inaccessible forests of Troodos and Paphos. Deer and boar disappeared. Moufflon, Ovis orientalis ophion, (now apparently renamed Ovis gmelini ophion) survived. This has evolved, rather surprising for such a short time, into an endemic form. Its population by the beginning of this century was reduced to a few dozen and it was then on the brink of extinction. The threats to it were intensive hunting, the spread of agriculture and the reduction of the forests. The moufflon population, because of strict protection, has increased substantially in the last few decades. Its population is now tentatively estimated at over one thousand animals. Moufflon can be found throughout the Paphos Forest. Today, the island's Cedar forest is restricted to one valley only. It also suffered from lumbering for shipbuilding and from forest fires. Under these circumstances its natural regeneration was also influenced from competition, from the more prolific Brutia Pine which is quicker in occupying vacant niches. The need for agricultural land led for many centuries to the clearing of forested areas. Vineyards and orchards replaced pine forests. It was not until late in the last century and the beginning of the present one, that strict forest protection and management practices were introduced. Grazing by goats, which had its impact in Cyprus, as it did in the rest of the Mediterranean, was also brought under control in many forest areas. Hunting is now prohibited in Paphos Forest and in parts of Troodos. High up on Troodos, in what approaches a semi-alpine zone on Khionistra, with its unique weather and soil conditions, special vegetation communities have evolved. In this area we find Juniperus foetidissima, a Cypress-like Juniper that is restricted to the topmost slopes of Khionistra. The Black Pine starts at an altitude of about 1.300 metres and finishes at just below this peak. At these higher altitudes it replaces the Brutia Pine, which covers most of the lower mountains - including the Paphos Forest - and stretches down to the plains. 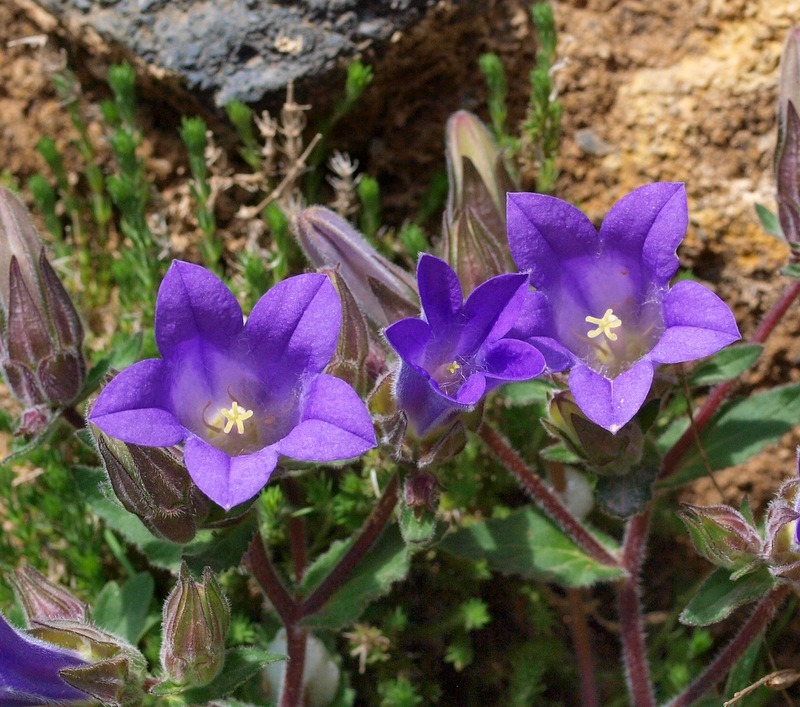 A great many of Cyprus' endemic plants are found on Troodos, especially in the higher altitudes. Out of the 130 or so Cyprus' endemic plants more than a third are found only on Troodos and mainly above 1,000 metres. The distribution of many other non-endemic plants in Cyprus is also restricted to the higher reaches of Troodos. The yellow flowered Alyssum troodi, an endemic species and A. cypricum, a near endemic, are confined, like many other endemic plants, to the serpentinite areas of Troodos. On Troodos many plants flower late in spring, well after the snows have melted spectacular, rosy-purple flowered Peonies can be found near Prodromos and in the forest in Madhari and Papoutsa. Under pine trees both in the Black pine zone and lower down grows the saprophytic orchid Limodorum abortivum, leafless, light purple and often taller than half a metre. Many other species of orchids grow high up on Troodos - Helleborine orchids, locally known as "The Holy Virgin's Tears," such as Epipactis troodi. As its name infers, it grows mainly in Cyprus, where it grows only on Troodos. Alder and the Oriental Plane Tree are common on river banks in many valleys. The endemic Cyprus Golden Oak, Quercus alnifolia, covers extensive scree areas, on steep slopes and is characteristic of the Troodos landscape. Strawberry trees, Arbutus andrachne, with their bright red fruit, shiny stem and branches, flourish mainly in the more humid areas, as do wild roses and Myrtle. Various rock-roses and an endemic Thyme (Thymus integer) abound in the area. Lower down on stream banks, in places such as the valley of Karkotis river, other communities and plants can be found. One of the great orchids rarities, Epipactis veratrifolia, which can reach one metre in height, honeysuckle, wild violets and the insectivorous Pinguicula crystallina, with its fleshy, sticky leaves, can be found here. The Akamas peninsula at the westernmost tip of the island of Cyprus is a paradise for nature lovers - read on to find out more about this wilderness and the groups who are working to preserve it for future generations. The Akamas peninsular is the most isolated and unspoilt area of Cyprus. It is said to have been named after the hero Akamas who returned to Cyprus after the Trojan war and founded the city of Akamanitis. It is an anvil-shaped piece of land which sticks out into the Mediterranean on the westernmost edge of the island, covering an area of approximately 17,000 hectares, of which 7,000 are State Forests. It is hoped that these State Forests will become part of a National Park in the near future. The Akamas is famous for its abundance of flora and fauna - it boasts 600 different plant species and over 100 different types of birds, mammals and reptiles as well as many butterflies. Akamas also has a rich historical and cultural heritage. People have lived here since the Stone Age and evidence of settlements can be found near the deserted village of Androlikou. There are Greek and Roman remains at Pampelon, Portrypetos and Agnades near Neo Chorio. It is also an area rich in churches from the Byzantine and later periods, such as Agios Minas (Neochorio), Agios Ioannis (Androlikou), Agios Georgios (Inia) and many more - Agios/Agia is saint in Greek, so Agios Ioannis is St John. One person you cannot escape in the Akamas is Aphrodite, the Greek goddess of love and patron goddess of Cyprus. The cult of Aphrodite can be traced back as far as 1500 BC and continued until paganism was banned in the fourth century AD. It was at the Baths of Aphrodite (in Greek Loutra tis Afroditis) that the goddess is said to have bathed before and after entertaining her many lovers, the most famous of whom was Adonis. The baths can be found at the end of the paved road which runs along the north coast of the peninsular from Polis and Latchi - just after the small village of Potami Chiflik. The Akamas peninsular can be approached from the east via Polis or the south via Agios Georgios and is idea for nature lovers or those looking for some peace and quiet in traditional Cypriot surroundings. There are many ways to explore and enjoy the Akamas - a number of environmental organizations and projects have been attracted to the area with the aim of preserving this beautiful wilderness and its village life for future generations. Here are some ideas for holiday makers who want to find out more about this very special part of the heritage of Cyprus. The Akamas range of hills reaches about 670 metres in height. The geology of the area and its morphology are varied, forming a complex mosaic which results in a multitude of habitats. Large parts of it are upper or lower pillow lavas. Diabase intrusions are found in these areas while areas of serpentinite fringe much of this ophiolithic complex. There are large parts of Akamas with sedimentary rocks, such as reef limestones, especially in parts of the north and southern slopes of the range. The limestone parts of Akamas, in several areas, are clearly reminiscent of the Kyrenia mountains with pine trees, junipers and with a profuse display of cyclamen (Cyclamen persicum) in spring practically reaching the sea. The autumn flowering Cyprus endemic cyclamen (Cyclamen cyprium) is also found in Akamas but this grows further inland in more shady and humid places. With the exception of the very impressive cliffs and gorges of the area perhaps most spectacular of the rock formations are those of the Mamonia formations typified by the Aetopetres terrain around the highest peak of Akamas. Here lichen-covered gigantic rocks dominate stark and spectacular landscapes. The vegetation of most of Akamas is characteristic of the Mediterranean shrub forests known as Maquis. The Maquis are in general drought (and goat) resistant forests with their vegetation consisting mainly of evergreen shrubs and small trees such as junipers, lentiscus and wild olive, with a variety of rock-roses and other bushes with, in places, a thin cover of pine trees. The Akamas peninsula is characterised by a large diversity of vegetation communities which are directly related to the area's very complex and varied geology and morphology. Man's influence on the vegetation of the area is minimal in the forest areas at least, though no doubt the original vegetation even in the forest areas was more lush. The fauna was also undoubtedly richer. Lack of water and the inaccessibility of the area spared the fate of most of the coastline of the island where agriculture and urban development have left little of the natural vegetation. Nonetheless forest fires, old and relatively recent, have taken their toll. Goats have also traditionally grazed there, probably since their introduction to the island by neolithic man. Goats left their impact on the vegetation of the area and, through the centuries, grazing (and forest fires) determined the degree of degradation of the original Mediterranean evergreen forest into the kind of shrub forests we, in the 20th century, recognize as maquis. The impact of grazing is now the subject of some debate, as controlled grazing may also have some positive results. Judging by their remains in nearby archaeological sites, deer and moufflon also grazed in some abundance in Akamas. They too were introduced in Cyprus by man, when he first colonized the island. The degree of degradation of the vegetation of various habitats in the area has resulted in various vegetation communities ranging from relatively dense pine forests to the overgrazed spiny burnet and Genista areas. The rich vegetation of Akamas includes many endemic species of plants. Many other species found here are rare in most of the rest of the island. Over 30 species of endemic plants grow on the peninsula. Of these Alyssum akamasicum and Centurea akamantis bear the name of Akamas and are found nowhere else on the island except, locally, in Akamas. Alyssum akamasicum grows only in the serpentinite areas. The endemic Cyprus tulip, Tulipa cypria, is found only in Akamas and near Turkish-occupied Myrtou. Locally, on the northern slopes of the Peninsula, we find the delicately scented Orchis punctulata, one of Europe's great orchid rarities. Out of the 50 or so orchids of Cyprus (i.e. species, sub-species and varieties) about half can be found in Akamas. The Lax-flowered Orchid, Orchis laxiflora, one of Cyprus' rarest orchids is found also on the northern slopes of Akamas. The fragrant Bug Orchid, Orchis coriophora subspecies fragnans and the closely related Holy Orchid, Orchis sancta, grow in abundance as does the Pyramidal Orchid Anacamptis pyramidalis. The area also abounds with a variety of bee-orchids including the newly described endemic Ophrys lapethica. Until recently the small Gladiolus triphyllus, which in Cyprus is found mainly in Akamas was considered an endemic species. It is a species closely related to the common wild gladiolus which grows mainly in cultivated fields. (Iladiolus triphyllus was recently recorded growing in small numbers on the mainland. Ancient junipers, some centuries old, grow in much of the area, growing into sizable trees in areas with deep soils, as for example at Fontana Amorosa. In areas with higher humidity Strawberry trees (Arbuto andracne and the much rarer A. unedo), oleanders and myrtle, often interwined with various climbers can be found. In the most humid of the valleys and gorges impenetrable thickets are formed where even goats do not venture. The gorges of Akamas, essential for the survival of a spectrum of wildlife, are of exceptional ecological importance. These cut deep into the chalk and the reef limestone areas, often forming high vertical cliffs and caves. Rare and sensitive vegetation communities have evolved here. On their inaccessible cliffs rare plants find protection from grazing while many species of birds and other animals take refuge and breed on them. The fauna of Akamas like much of the fauna of the island has been studied to a small degree and begs for more detailed study. It is known, however, enough for its value to be appreciated and for the threats to it to cause concern. As is to be expected from an area that is practically virgin and extensive it contains practically the whole spectrum of the Cypriot mammalian (and other) fauna with the exception of the moufflon. Species such as the endemic Cyprus White-toothed Shrew (Crocidura cypria), hedgehogs, hares and foxes can be found here. Several species of bats including the fruit bat, which has Cyprus as its northern limit of distribution, shelter in caves in the area. The reptilian fauna of Akamas is rich and most species identified in Cyprus have been recorded in Akamas with the possible exception of the newly identified endemic snake, Coluber cypriensis, the distribution of which is still being researched into. Of the land reptiles there are sizable populations of the endemic variety of the lizard Lacerta leavis troodii as well as of the Spiny-footed Lizard (Acanthodactylus schreiberi). The Spiny-footed Lizard's distribution is mainly along the coast of Cyprus and its populations are endangered in much of the southern coast. The Green Toad (Bufo viridis) is the only one of Cyprus' three frogs that is present in Akamas in any numbers and even this species is relatively rare in the area. The diversity in the habitats and in the flora of the area and the fact that insecticides are little used there, have resulted in an exceptional diversity in the insect fauna of Akamas. Numerous butterflies, some very rare, can be found in the area. Butterflies such as the Cyprus (or Paphos) Blue (Glaucopsyche Paphos), the Cyprus Meadow Brown (Maniola cypricola) the Cyprus Grayling (Hiporchia pellucida cypriensis) are on the wing from early spring. Mention must also be made of the very rare and spectacular Two-tailed Pasha, Charaxes jasius, which is dependant probably on the handful of Arbuto unedo trees found in this area. Similarly the Cyprus endemic variety of the Eastern festoon, Zerynthia cerisyi cypria, a fairly rare butterfly is dependent on the exotic looking Dutchman's Pipe (Aristolochia sempervirens) which is found in the gorges of Akamas. There are several small springs and seepages in the area. Some, like the Baths of Aphrodite and Ayios Kononas and the elusive Fontana Amorosa, are well known. These springs are precious for the survival of the fauna of the area especially in the long hot summer of Cyprus. Most springs have their own freshwater fauna and flora: small snails (Melanopsis praemorsa and Theodoxus anatolicus), a freshwater crab (Potamion Potamios), several crustaceans and several aquatic species of plants (e.g. Chara algae community). Other species of plants depend on the existence of damp soil e.g. Juncus spp, Schoenus nigricans, Samolus valerandi, Prunella vulgaris, Potentilla reptans and some orchids. The freshwater crab which still survives here has disappeared from many parts of Cyprus as a result of the extensive use of DDT and other insecticides during the campaign against malaria. The use of less harmful insecticides in recent years has seen some recovery of certain populations of this crab. As with some frog populations, crab populations have not all shown recovery and must be presumed extinct in some areas. Sand dunes (along with wetlands) are probably Cyprus' most endangered habitats. Most sand dune areas have disappeared, or are very rapidly disappearing, as natural habitats, from the south coast of the island (Ayia Napa, Moni, Paphos). In Akamas some are still surviving and they are restricted to the Lara area mainly. Their vegetation is unique. Rare and endangered plants and plant communities as well as animals depend on them. Species such as the spectacular Sand Daffodil (Pancratium maritimum) and the sand dwelling Spiny-footed Lizard (Acanthodactylus schreiberi) thrive there. On some of the beaches adjoining these sand dune areas lives the ghost crab (Ocypode cursor), an endangered species which has disappeared from many of our tourist beaches. This is now a protected species under the Fisheries Legislation, along with terrapins, sea turtles, dolphins and seals. On the west coasts of Akamas, on the relatively remote beaches of Lara and Toxeftra, sea turtles lay their eggs. Both the Green Turtle, Chelonia mydas and the Loggerhead Turtle, Caretta, nest here. The Green Turtle, is the rarer in the Mediterranean and, with a population of probably less than 1000 nesting adults, is now in imminent danger of extinction in this sea. In the Mediterranean it now breeds mainly in Cyprus and in some beaches in Turkey. The sea turtles arrive here from various parts of the Mediterranean to lay their eggs. They nest in summer, from the beginning of June to the end of August. They nest every 14 days, laying 3-5 clutches of eggs in the season. Each time they lay about 100 eggs. They hatch some seven weeks later. In the past Green turtles used to breed on other beaches in Cyprus also, on beaches such as those of Ayia Napa, Protaras and Potima. Some are now well-known tourist beaches; others have been ruined by sand extraction. Loggerhead turtles also nest in the Polis beaches and, in small numbers, on most other beaches which provide some privacy at night. The Department of Fisheries started a programme in 1976 aiming at the conservation of the turtles that breed in Cyprus. In addition to other measures, a station-hatchery was set up at Lara in 1978. The project aims among other things at increasing recruitment of young turtles into the population. This is achieved through the protection of the turtle nests from various dangers such as predation by foxes and inundation by the sea. About 80% of the eggs laid on the beaches of Cyprus are either eaten by foxes (as eggs or hatchlings) or perish by getting covered by the sea. Each year some 6,000-7,000 young turtles are hatched either in hatchery or under protection in situ, and then set free. The Lara - Toxeftra area has, since 1989, the status of a protected area under the Fisheries Legislation, with management regulations in place during the nesting and hatching season. In order to effectively tackle existing and potential threats to the sustainability of the area the issue of the Akamas is currently under study by a team of consultants, with the financial support of the European Union and the World Bank. The study aims at achieving the sustainable management of the area, that is, safeguarding its biodiversity and ecological integrity whilst securing a sustainable future for the area's population. When you plan a visit to a new place, and want to see some of the natural history there, it is difficult to know where to look for the information you need. If you are planning to visit Cyprus, and want to know where to find orchids there, you need look no further than a new book and video by Joan Hubbard and Pamela Scraton. The book gives easy but detailed descriptions of all the orchids currently known to be found in Cyprus, with site details, and charts and calendars to help you plan your trip and identify what you find. The video contains vivid digital photography which will enable you to learn before you come, identify orchids in unusual forms, and will provide you with a lasting record of the visit. And because we know you will not have access to a VCR in the field, there are thumbnail reminders of each orchid at the back of the text. All the video footage has been shot in the last twelve months, and contains the first published images of an orchid rediscovered by the authors after 40 years! When Is The Main Season? February and March are good months for the spring orchids. Most of the mountain species can be seen in mid-to-late June. These are the endemic orchids of Cyprus - just a few of the fascinating species you could find here, with the aid of this new book and video. We have already had mail orders from six different European countries, and some very Enthusiastic comments; the book and video are now on sale in Cyprus bookshops. The Pitsillia area lies on the eastern slopes of the Troodos mountain range. Picturesque villages cling to the mountain side amid vineyards, orchards of almond and hazelnut trees, and an astonishing array of wild flowers. Pitsillia area is reached either from Limassol, on the Limassol-Ayios Theodoros-Agros Road, or Limassol-Kato Amiandos- Karvounas-Kyperounda road, or from Nicosia through Palaichori-Agros, or through Kakopetria-Karvounas- Kyperounda. 28 km north of Limassol on the south of the Troodos range, off the Limassol-Agros road. In the middle of the village is the small church of Ayios Mamas built in 1455 with wall paintings some signed by Philip Goul. 45 km north of Limassol through Ayios Theodoros, Agros is the centre of the district. It has a good dry climate, gardens of roses, cool springs and hotels for visitors. A 19th century church in Byzantine style now stands on the site of a 9th century monastery of Panayia Eleousa Agrou, founded by monks from Constantinople. 45 km south of Nicosia on the Nicosia- Agros-Limassol road, and 15 km from Agros. The Church of the Transfiguration of the Saviour (tou Sotiros) is an early 16th century chapel on the hill overlooking the beautiful old village. Its interior is completely painted with one of the most accomplished series of murals, of the post-Byzantine period in Cyprus. The church of Panayia Chrysopantanassa was built in the 16th century and is the main church of the upper village. Platanistassa village, 15 km from Agros, 30 km off the Nicosia-Astromeritis road, turning left before Peristerona village. A 15th century church, lying about 3 km outside this very pleasant old village, retains the most complete cycles of mural paintings of the second half of the 15th century in Cyprus. Visitors can ask for the key from the village priest. Panayia Tou Araka At Lagoudhera. Lagoudhera village, is 15 km from Agros or off the Kakopetria-Troodos-Limassol road (Karvounas crossroad). The 12th century church stands just outside the village with some of the finest frescoes of the late Comnenian style (I 192), prevailing throughout Greece, the Balkans and Russia. Together with Assinou church and that of Ayios Nikolaos tis Steghis, it is considered to be one of the most important Byzantine churches on the island. Visitors can ask for the key and be escorted by the priest who can be found in the premises next to the church. 7 km off the Kakopetria-Troodos road, after Spilia village. The village's early 16th century church, containing frescoes of the same period, is dedicated to the Virgin Mary (Panayia). 3 km below Kato Amiandos, off the Karvouna-Limassol road, 32 km from Limassol. Once the property of Jean de Lusignan, son of the Lusignan King of Cyprus, Hugh IV. There are two interesting churches, the 14th century church of Timiou Stavrou with beautiful wall paintings and the church of Panayia Katholiki in the middle of the old village which dates to the early 16th century with paintings of the ltato-Byzantine style.